Is Homer really a Catholic? HE MAY SAY grace before his meals, believe doughnuts are proof positive of God’s existence, and live in fear of eternal damnation, but Homer Simpson’s no Catholic, the show’s producers have insisted. The position puts them into direct conflict with the Vatican’s recent efforts to espouse Springfield’s most famous resident as one of their own. 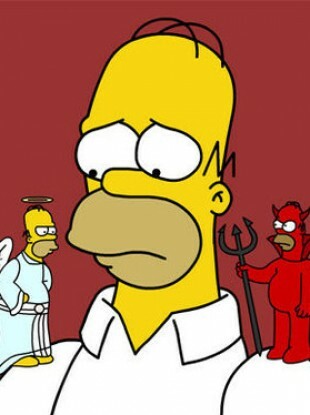 Few people know it, and he does everything he can to hide it, but it is true: Homer J. Simpson is a Catholic. The Simpsons are among the few TV programmes for children in which Christian faith, religion, and questions about God are recurrent themes. That’s absolute hogwash, say the producers of the Simpsons. Al Jean, executive producer of television show, told AP the pair only considered converting for one episode, which aired in 2005. We’ve pretty clearly shown that Homer is not Catholic. I really don’t think he could go without eating meat on Fridays — for even an hour. In the episode, Marge explains why she could never take to mass. All that sitting, standing, kneeling. It’s like Simon Says without a winner. Meanwhile, the author of an in-depth religious study on The Simpsons claims the Vatican newspaper misinterpreted his findings. I wouldn’t say they’re Catholic, I would say they’re people of faith. I would say that the Simpsons are open on the question of God. The authors are fiercely critical of some religious people but they respect faith, openness to God, prayer and going every Sunday to listen to their pastor — even if they sleep or eat popcorn when they go. Email “An answer to the question tormenting theologists...”. Feedback on “An answer to the question tormenting theologists...”.